I have been trying to find recipes for snacks and meals that use the ingredients that I already have in my pantry. 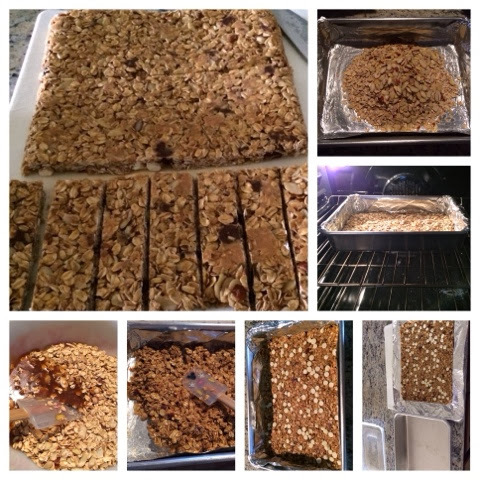 Since my kids love snacking on granola bars, I decided to try making my own. I looked over a few recipes but the one I used today is from the inspired fast blog found here. This was a quick and easy recipe that you can do finish in about 20 mins. I did this while my kids were eating their breakfast so as a bonus it was ready in time for their morning snack! A few things I did differently from their original recipe. I used a 9x13 baking dish rather than a square so mine turned out a bit thinner. I used sliced almonds. I also added in peanut chips and white chocolate chips and no raisins. Needless to say mine turned out very sweet. Next time I'm cutting out the brown suger and reducing the chocolate chips. Heat oven to 350F. Line bottom and sides of 9x13 baking pan with foiled and spray with cooking spray. Mix oats and nuts in lined pan and bake for 5 mins, stir and bake another 5 mins until lightly toasted. Transfer to large bowl. In separate bow, combine butter, honey, brown sugar, vanilla and salt. Microwave for 30 secs. Stir until combined and smooth Microwave another 30 sec. Transfer oat mixture to lined pan and use rubber spatula to firmly press down. (Press hard this way the bars will stay together). Scatter 2 tbsp white chocolate chips over granola mixture and use rubber spatula to press down. 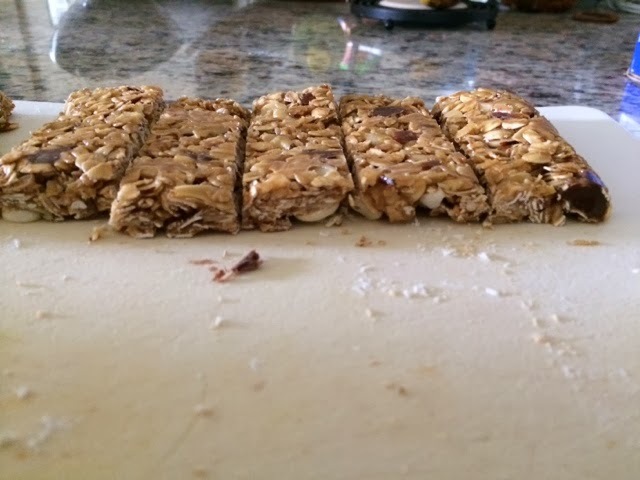 Remove block of granola from pan then peel away aluminum foil. Cut into bars.